For the Sake of Art — Geoffrey Lewis Architect, Inc. The title of this project very much describes the objectives set forth by the Owners. ‘For the Sake of Art’ encompasses both the restoration of a truly remarkable piece of architecture and the integration of a modern art collection. Modern Art is best exhibited with a simple backdrop which was provided perfectly by the historic grandeur and simplicity of the existing dwelling. 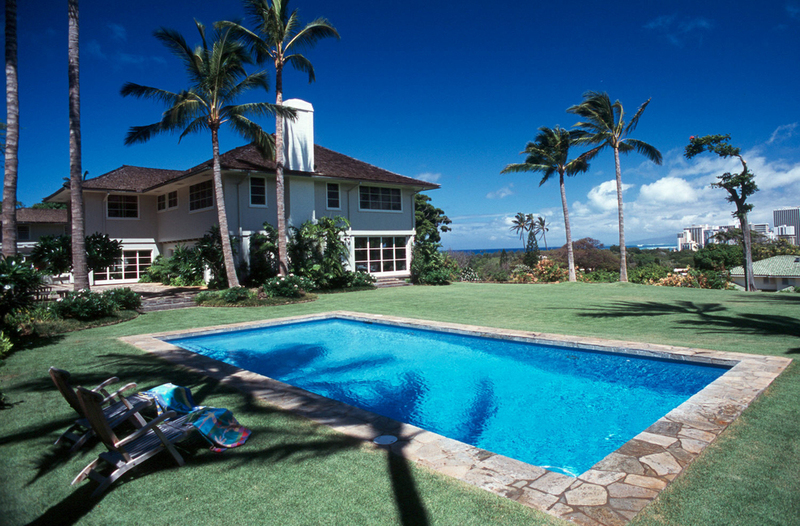 Perched on the North-Western slopes of Diamond Head, this 7,000sf house was originally constructed in 1939. Based on original construction photos, it appears this house was one of the first to be constructed in the vicinity. The original Owner, Mrs. McLean was the designer and supervised construction. There was never a question in the Owners mind about restoring this historic master piece; it would provide the perfect back drop for their amazing collection of modern art. The large, but excellent proportions of the existing spaces are perfect in scale for typically larger scale modern paintings and sculpture. There were very few plan changes to the existing house. The kitchen was modernized and made a bit more family friendly and now includes a passage to the garden lanai. In addition, a connection was added between the master suite and reading room. This connection now provides the master suite with beautiful views of Waikiki while enjoying the privacy of the Diamond Head bedroom. Most of the bathrooms were updated while maintaining this period of the architecture. A garden pool was added to the estate in a way that minimizes its impact as a recreation pool and blends it in more as an integral part of the beautiful gardens.